It isn’t easy to correlate a gun being pointed at your head with the lilting beauty of a monarch colony, rising into the pine-scented sky from the Sierra Madres to head south to Mexico. But these monarch butterflies, dining on milkweed, once prevalent in the Midwest, are now being all but eradicated due to Monsanto’s GMO creations and pesticide. 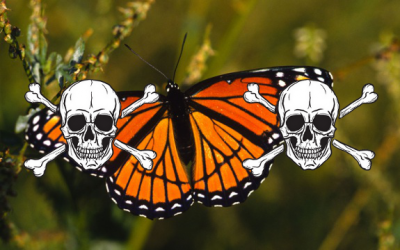 Monarch colonies in the United States are now close to extinction. We can thank over a million acres of Bt corn and soy for that, and of course, the Bio Tech Giants, including Monsanto. But this is what is happening. First the bees. Then the butterflies. Then us. Monarchs pollinate an estimated 75% of all food crops. They are the only known species to make a two-way migration – all for Asclepias L. There were once over 60 million butterflies that made the migration to the US from Mexico so that their young could dine on milkweed, a ‘trash plant’ that the butterflies adapted to their diets over millennia – the only plant that their larvae will eat. Now these numbers are fatally low – correlating to the over 80% decline in the presence of milkweed in the US. Iowa State University biologist John Pleasants has watched the corn fields in his state over the last decade and a half. Before RoundUp, milkweed grew in and through the fields, and now there isn’t a single plant to be found. The herbicide may have killed unwanted weeds, but it also killed Monarch food. Monsanto and the FDA know this. They’ve been presented with evidence from concerned scientists the world over, and their response? Who could be more productive in agriculture? The butterflies (and bees) were already doing much of the work for us. Monsanto exces have been presented with numerous studies including one from Cornell University wherein scientists exposed Monarch butterfly caterpillars to pollen from Monsanto’s genetically engineered corn. None of the butterflies eating pollen from “natural” corn died, while 44% of the Monarchs eating the pollen from genetically engineered plants (full of Bt toxins which they swore to us were safe) died in just four short days. Bees fed Monsanto-made pollen also died. Monsanto hasn’t been able to carbon-copy real, natural bee pollen, either, though it has likely been thought of. This is just another nail in the coffin of the natural world that Monsanto seems hell-bent on destroying. And though it seems far-fetched, we being the top of the food chain and all, we’re next. Monsanto’s Bt toxins have already been proven to kill human embryo cells. Farmers are heeding the call, though. Recently more than 20,000 milkweed plants were re-introduced to fields. And some people are even giving away free milkweed seeds to try to save the Monarch colonies. In Austin, they are planting ‘pit-stop’ plants, so that the butterflies have something to dine on through their migration. These individuals are still in the minority though, and the butterflies are dying in record numbers. As ‘concerned and empowered citizens’ though, we can act with more momentum and gusto. I am reminded of a phenomenon also specific to butterflies — that of the imaginal cell. A butterfly grows about 27,000 times its original size from birth. When a caterpillar builds its cocoon to become a butterfly, it is the imaginal cells that signal time for a change. The caterpillar-becoming-butterfly doesn’t recognize these imaginal cells at first, so the immune system attacks them, not realizing that they are part of their destined metamorphosis. They treat them like cancer cells, even. But those imaginal cells are persistent. They start as a small minority, like the people giving away free milkweed, or the people standing up to Monsanto outside their share-holder meetings, and then this minority starts to grow. Eventually a string of imaginal cells turns into a string of DNA, just like our own, and realizes that the caterpillar is really a butterfly, and thus the transformation can occur. Monsanto may be intent on killing us all, but we are stringing together, and once a minority, we, the outspoken activists, will destroy this killer of nature. But it only happens if you join us. Please share this story with as many people as you can, so that others can be part of the positive transformation of this planet as well. Let one thing be known to all around the world. Monsanto & Co. Will Fall and they Will Fall Hard. NO ONE will stand in the way of Truth, Reality, And Absolute Justice; Not the Sham US incorporated Government, Not corporations, and not Value-less linen paper currency. Nothing will stand in the way of Justice, so it is You, Monsanto, Not we, Who will Bow Down Before The Almighty Nature. Can you share a timeline when this is supposed to happen? I want to make sure I pencil it in.